The Buchan is in Glen Trool, one of the most beautiful glens in Southern Scotland, in the heart of the Galloway Forest Park. It is surrounded on all sides by many miles of wild and unspoilt landscape, with mountains, lochs, glens, rivers, burns and forests. These offer exceptional walking, including many from the house itself. 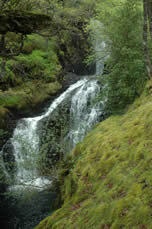 These vary from relatively easy walks along the glen and around the loch to more challenging routes in the mountains. The Visitors Book proudly records many successful ascents of the Merrick from the house, the highest mountain in Southern Scotland. Galloway Forest Park is also renowned for its mountain biking, with trails passing The Buchan. Fishing is available in many local lochs and rivers, with permits from the Glen Trool Visitor Centre. This also provides snacks and teas, along with a gift shop. It is open from Easter to October. The Buchan also provides a good base for exploring further afield, to the historic towns, spectacular coasts and beautiful countryside of Wigtownshire, Galloway, Ayreshire and Dumfries. For practical reasons we recommend that you do not arrive with large stocks of frozen food but encourage you to explore the market town of Newton Stewart which is 13 miles away. There are four supermarkets, the High Street Co-op being open until 10pm seven days a week. Discover the delights of the local meat at the award-winning butcher in the centre of town, who also stocks a variety of local specialist products in his in-house delicatessen. On the A75 just before Creetown (about 6 miles east of Newton Stewart), the Galloway and Marrbury Smokehouses are well worth investigating - including for fresh fish. We also recommend William Lindsay, the butcher in Creetown. The local Cream o'Galloway ice cream - based near Kirkudbright but widely available - is a Must Try! See also the Links section.